"WHAT??? Tuition... and Mandarin one somemore???" 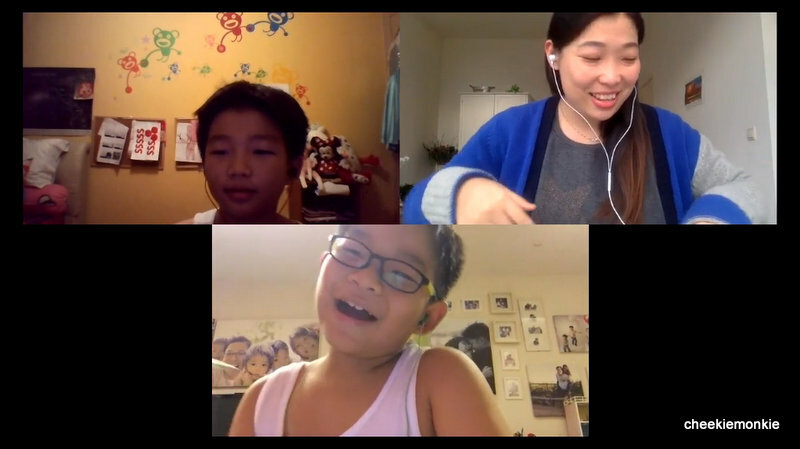 That was the epic reaction when I first told the boys that they will be trying this online tuition programme where they will attend weekly Mandarin lessons - complete with a tutor - together from the start of the year. But all things changed when they learned that the lessons will be conducted virtually, from the comfort of our home and through the laptop and iPad. "COOL! When do we start???" VivaLing is the world's first online language academy where kids can enjoy fun, interactive and effective language learning without leaving the house. 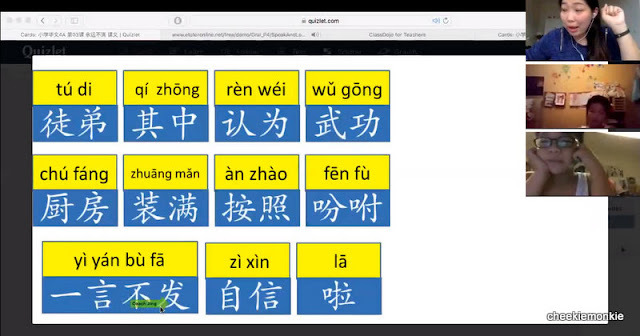 They offer English, Mandarin, Spanish and French to young learners, aged 3 to 15, through real-time video with native and highly qualified language teachers. For parents in Singapore though, the areas of concern I reckon will be English and Mandarin and I was glad to know that the programs for both are tailored according to MOE's curriculum. But what sets it apart from the traditional tuition centres is VivaLing's pedagogical approach which is 100% children-centric. It is based on the fact that communication (oral and written) is both the objective of a language and a means to learn it. But communication alone is not enough, so the VivaLing approach provides for controlled and structured learning. It activates language learning by using content that is personalised, relevant and highly engaging for the child - ideal for children to experience the joy of learning, while also achieving the MOE’s desired outcomes at the same time. Sounds all and good, but how did the monkies take to it? 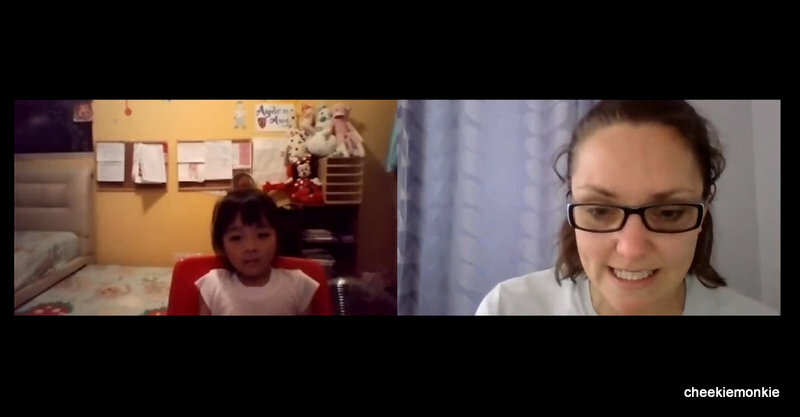 Prior to sitting down for lessons proper, parent and child will have a chance to talk to a VivaLing Expert via a video conference call so as to create a profile for the child. This, as I realise later, was crucial for the prospective teacher in getting to know more about the character of the child, and to tailor the sessions according to his/her likes and dislikes. Is the child sociable or shy? What are the child’s favourite things? What activity does the child enjoy doing? These questions and more were posed to the monkies during the session and the information gleaned were then fed to the language coach and used in future lesson in order to pique the pupil’s interest. So if the child likes Batman, then Batman will be incorporated into the lessons. 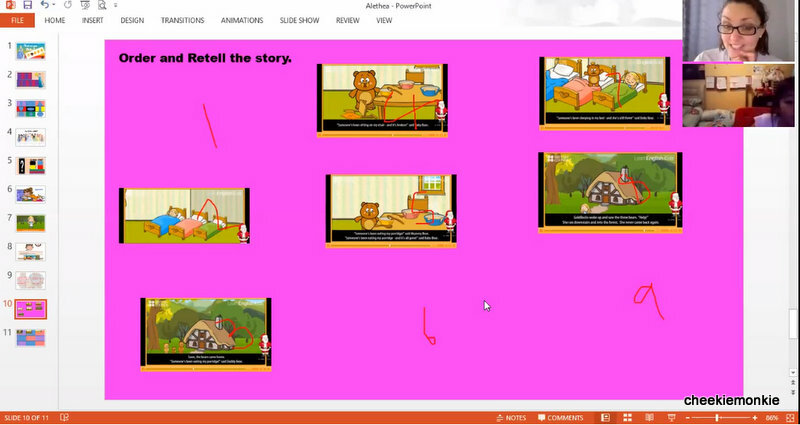 Or if like Ale, princesses are the flavour of the month, then princesses will find their way into the online lessons. With the introductory session done and dusted, it was time for the boys' first lesson! 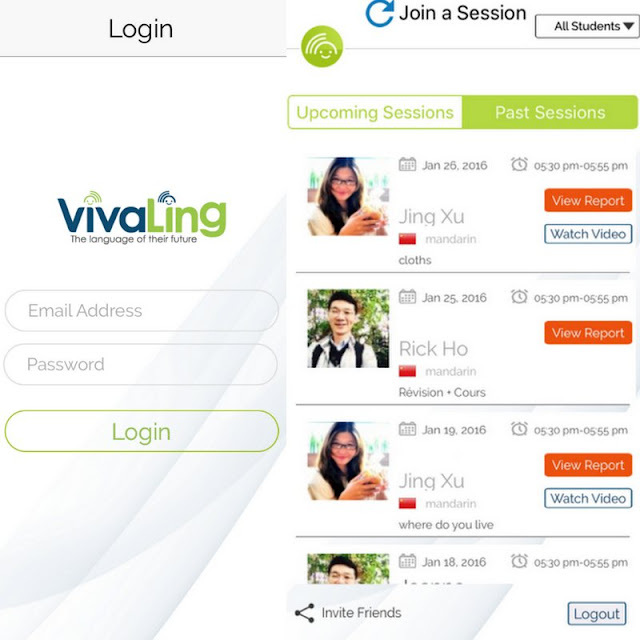 At VivaLing, there are two options for lessons: One-to-one English and Chinese classes from Kindergarten to Upper Primary classes for a highly personalised approach OR Very Small Group (Max 3 kids) English and Chinese classes for P1, P2 and P3 kids. As Ash and Ayd are currently P5 and P4 students respectively, a special concession was made to allow them to attend the Very Small Group lesson - which is actually for P1-P3 kids - together. And from the onset, I could see they were clearly enjoying the lesson which was made even more fun from the fact that they were able to see each other via the tiny windows on their respective screens! A huge chunk of the fun as the boys told me later, was actually due to the teacher. VivaLing prefers to use the term 'coach' rather than teacher because its approach focuses on guiding kids during their learning journey, as opposed to simply standing in front of them and ‘teaching’. Parents will be able to select their desired coach before starting lessons by perusing through their profiles. But no matter which coach, VivaLing's coaches are all native speakers and they all have a strong background in school teaching. They will be able to adapt the content, the style, and the pace according to the child’s personality and learning objectives so as to keep children interested and engaged, even the more fidgety ones! I stole a few peeks during the boys' first lesson and trust me when I say it was anything but a monotonous one. 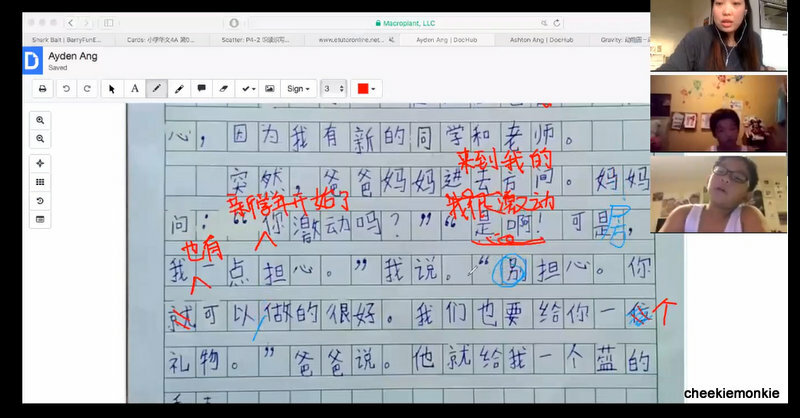 The content of the lesson was clearly based on their school's Chinese textbook but the manner in which the lesson was executed was way different from a usual tuition lesson. Sure, there were the usual reading of passages and Mandarin word recognition quizzes but the main selling point of VivaLing has got to be the wide range of interactive tools the coaches use to make each lesson unique and captivating. These include games, contests, videos, e-books, cartoons, songs and flashcards - all of which managed to hold the boys' attention for a good 55 minutes. In fact, my house was filled with their voices and laughter as the boys plotted to outdo each other in the various mini Mandarin games throughout the session. Nothing like a friendly competition to keep them motivated and stay focused during the lesson! And just in case you are wondering, there is homework too. 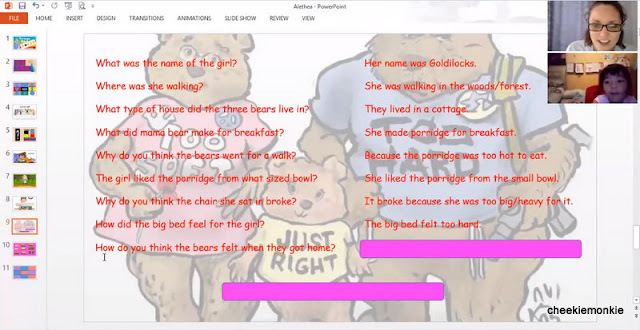 Again, the homework is structured and based on the individual child's weakness in the language. For the boys, their homework consisted of essay writing as it is their bane of the subject. 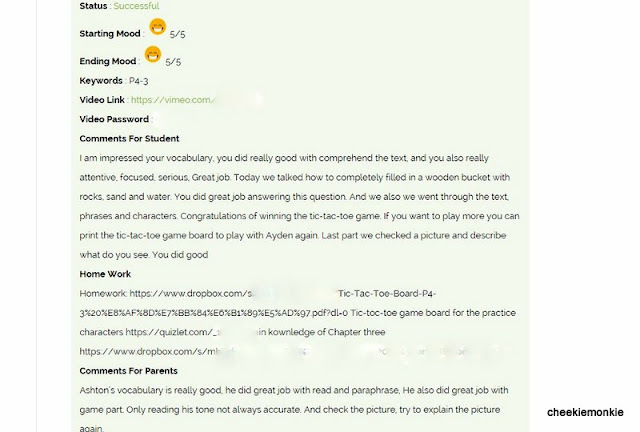 Surprisingly though, they finished their homework without prompting, and even reminded me to scan their essays and email their coach so that she will be able to mark them in time for the lesson. Unbelievable. 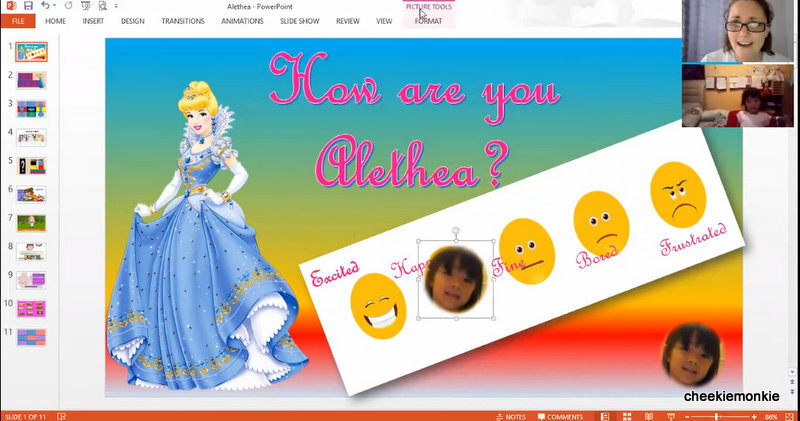 And seeing how much her brothers had enjoyed their lessons, Ale was all raring to begin her online English lessons with VivaLing too! Initially, she was a little apprehensive of the session. But kudos to her coach, Felicity, who managed to engage her... with princesses, what else! In fact, Ale was amazed by the fact that her coach knew that she loved princesses. Of course, she did not know that her likes had been relayed to the coach beforehand. Lol. As the session progressed, Ale became more and more talkative. 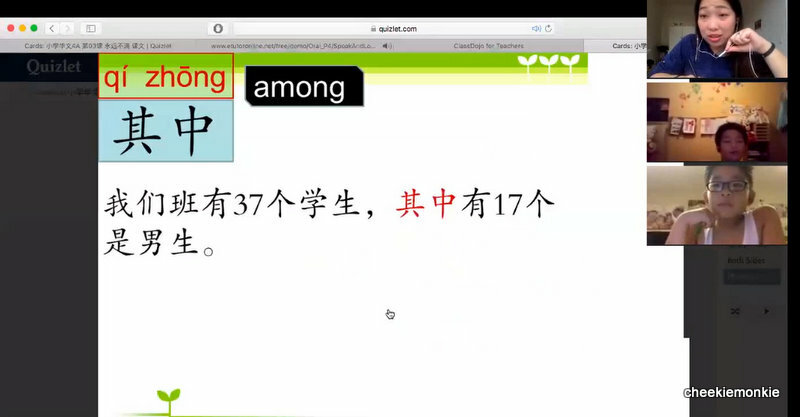 Which is a good thing, since one can only improve by talking when learning a language! I suppose it has to do with the fun games they played too, while reviewing the alphabet, colours and shapes at the same time. Parents have access to their own private dashboard where they can book or change sessions for their kids. But the most important and helpful bit I find is that every session that the monkies attend is recorded and made available to me. The video is made available via a link (password-enabled) and I am able to watch the entire session to know exactly what they had learnt for that particular week. In fact, the monkies can even watch the videos over and over again and they become like a second, third or fourth refresher session! 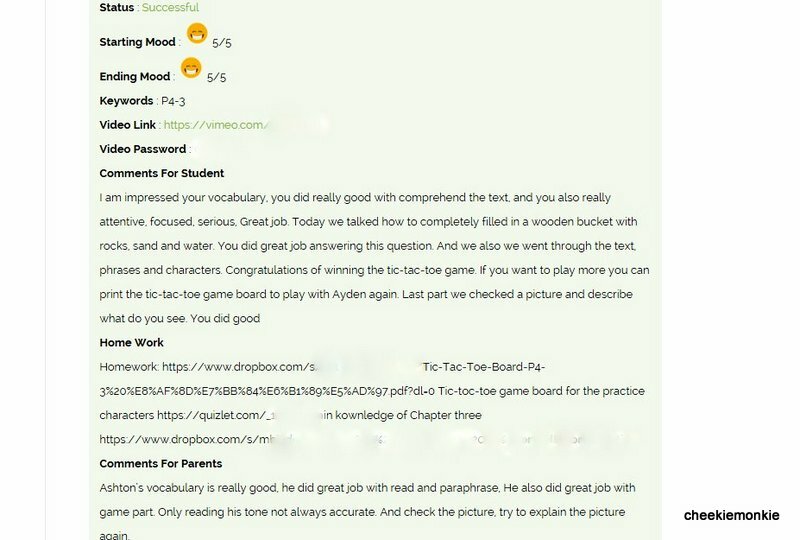 Each session also comes with post-session comments for the student and parent, together with any homework for the week. I had Mandarin tuition when I was a child, and I dreaded heading to my tuition teacher's place every single week. But looking at the monkies, I do not think they were dreading it. Conversely, they were looking forward to it every single week and when their 3 sessions ended, they were genuinely disappointed. Ale, in particular, missed her coach pretty much. 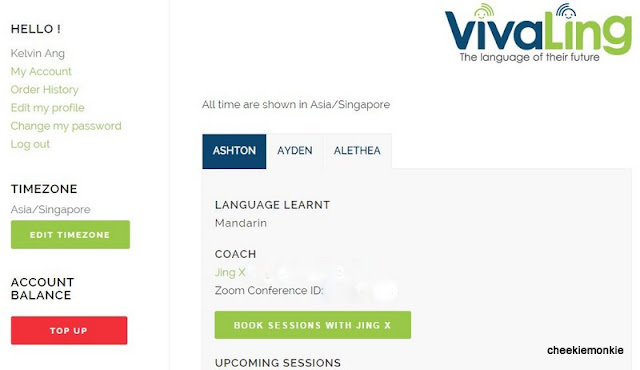 Of course, 3 sessions are not adequate enough for me to gauge the monkies' progress in the languages but in terms of eagerness to learn, the sessions with VivaLing clearly did the job. Especially with the online dimension of the teaching providing a new, innovative, efficient and refreshing way of learning with interactive digital tools for the kids. For parents though, the best part of VivaLing's classes is probably the convenient aspect of it - no more rushing all over the island for classes and having to contend with traffic and parking! 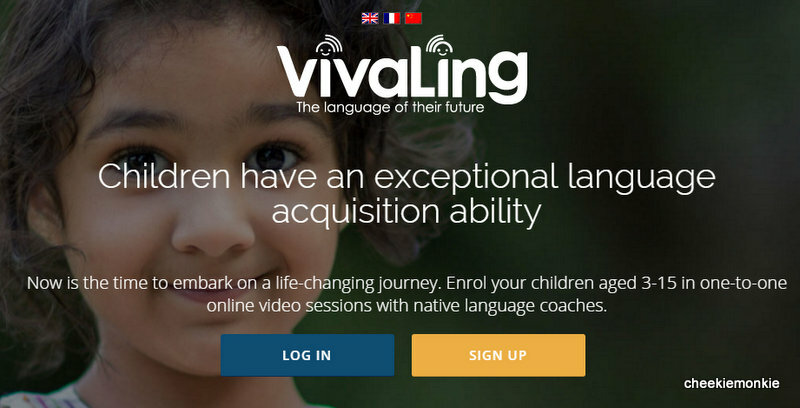 To make it easier for children to access their lessons, VivaLing has launched its brand new VivaLing app for iPads and iPhones. It is very intuitive to use, and easy enough for kids to connect to their virtual classroom all by themselves by just clicking on the app. The app also enables parents and kids to access their sessions reports and videos. Best of all, the app sends out notifications just before every session as a reminder. And yes, the app is FREE to download! To find out more about VivaLing's programmes and pricing, visit www.vivaling.com. sorry that I missed out on replying you. My kids only had the 3-lesson trial each. The lessons sound great! May I ask why you did not sign up for the online lessons full-time? Also, is it 3 lessons per week? We didn't continue because the boys already have an existing tutor. You can dictate the number of lessons per week.